It did cross my mind that I perhaps ought to write a ‘Brexit special’ bulletin this week given that topic’s dominance of the news. I’m sure you would be fascinated to hear Wellington’s official line on the customs’ union, the single market, frictionless borders, the ‘back-stop’ and all other pertinent matters. Perhaps not! You know me; I like to remain neutral and objective and avoid any form of controversy so best not express a view. Suffice to say, if the soap opera / sitcom / farce currently playing out in Westminster wasn’t so potentially damaging to our country (and its future generations) in economic, social, political and many other terms, it would be totally laughable. Anyway, if the current crop of Westminster wannabes (feel free to provide your own alliteration) can’t sort Brexit out, I know a group who could! Yesterday, Mr Holt took members of the School Council to a Trafford Youth Cabinet event at the Town Hall, hosted by leader of the council, Andrew Weston. 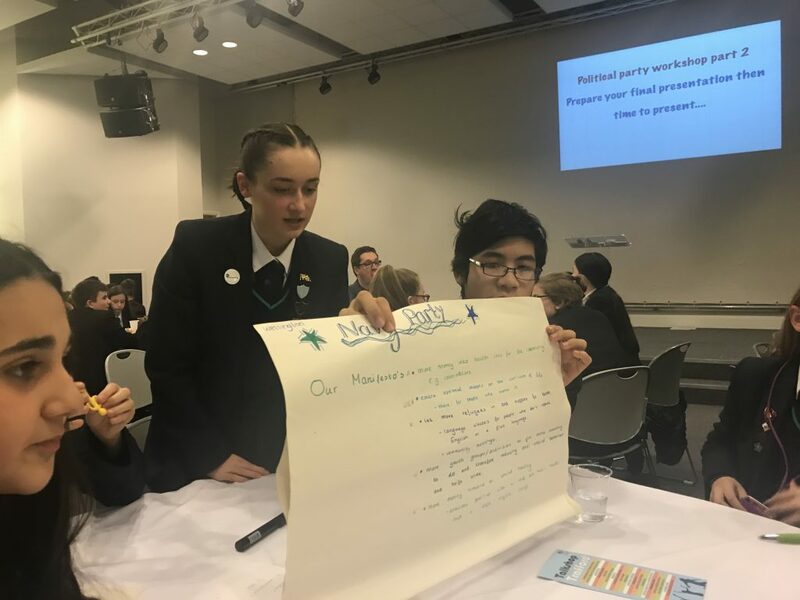 They competed against other Trafford Schools to create their own political party along with its principal policy concerns, a campaign and slogan. To cut a long story short (Mr Holt may provide the full unabridged version at some point) … we won! Of course, you will be aware that I am not a competitive person by nature (?!!) and ultimately it was the taking (a)part that mattered. Furthermore, I take no great pleasure from proving victorious against / smashing / wiping the floor with our selective school neighbours in Trafford (told you I was objective and non-controversial). The students were absolutely brilliant by all accounts in the preparation of the tasks and in their presentation (photos below). 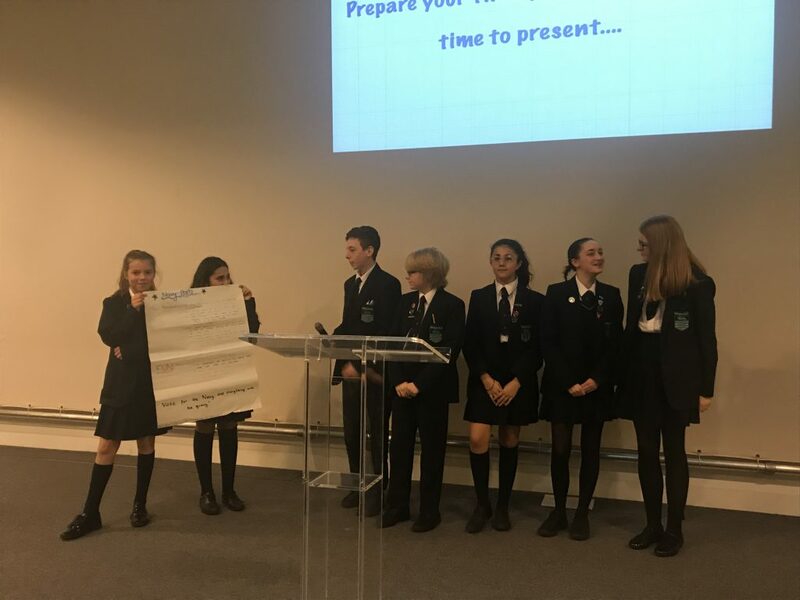 Those involved were; Mia Liddell Y10, Hannah Gibson Y10, Kallia Politsos Y8, Ellie Politsos Y7, Will Hayselden Y7, Elizabeth Hayselden Y10, Joseph Lee Y10, Tom Pavey Y10, Adam O’Neill Y9 and Erin Clements Y7. A formidable ‘team’ if ever I saw one. I guess this means I can probably sit back or even sail off into the sunset and let this lot run the School. Actually, my debts, wife and children would deem that a bad idea but notionally I’ve no doubt they’d make a damn good job of it. Movers and shakers of the future? Watch this space. You can read about further success (to varying degrees), this time of a sporting nature with matches in netball, hockey and handball this week. On the subject of sport and rugby more precisely, a quick apology to the rugby players and their parents; we’re a little stretched at the moment in the absence of Mr Higginson (broken leg) and have been unable to play as many matches as we would have liked. Particular apologies to the Year 9s, a great bunch of lads and a very capable team. I can promise you that we will make up for the current absence of fixtures with Trafford and Cheshire tournaments and more friendlies between now and the season’s end in March. Just keep turning up for training please boys. Thank you to those parents of sportsmen and women in the School who have downloaded the app and are subscribing to ‘notifications’. This is proving extremely useful for communicating any last minute changes / cancellations. Beyond the sport, thanks to Mrs Kearney, Miss Fairbairn, Miss Hitchens, Ms Collins, Miss De Sacco and Mrs Booth for their contributions to the bulletin this week. There may be others that I have not had chance to read, so please don’t take offence, colleagues. It was, of course, Remembrance Sunday last weekend, and as always Wellington students past and present distinguished themselves in their various roles and with their contributions. I haven’t had information from everyone by any means but well done to Connie Bennett, who left last year, who laid a wreath on behalf of the RAF Cadets during the service at Hale war memorial and to Josh Roberts who, once again, played the Last Post superbly at Christ Church, Timperley, as part of their commemoration. There will have been many other students taking part in similar events, I am sure. Whoever you are and wherever you took part, you make us ever so proud. I’m sure parents are aware but just a reminder that Year 13 mock exams start a week on Monday and Year 11 the week after (3rd December). Students, as always, have received plenty of support and guidance in School as we head towards this important period but of course they will need a bit of TLC and the occasional push at home as well. A significant part of our success is down to the parental support we receive and I’m sure you’ll help us help our youngsters through the challenges ahead. Can I also remind you that the Christmas Fair takes place a week on Sunday (25th November) between 9.30 and 12.30. There are still spaces for stalls available, so contact Sue Byiers at School if you’re interested in selling your wares, and please be generous with donations to our bottle, toiletries and chocolate tombolas. Time to head home, possibly via the fitness suite, for another weekend of taxi-driving the kids, sports-viewing, homework, the requisite quaffing of the red stuff and whatever other little surprises the next couple of days throws up. The weekend is often considered too short by many but think of it in these terms; it’s probably longer than Mrs May has left in charge of the Tory party! One could almost feel sorry for her. I am not being political in any way, of course, but I can’t help but wonder what planet / century / time machine / Enid Blyton story the (spineless?) Jacob Reece-Mogg arrived from. (Whoops! Losing my impartiality / objectivity). Better leave it there.